Headed out at 5:30 this morning with Pat to try to catch a fish. Weather was perfect despite the forecast of rain. The problem, however, was the tide. It was dead low and not moving. This is always a problem for fishing. We saw a few splashes and we caught some nice live bait but the larger fish were not interested. And NO, I didn't eat the bait. For short while I considered throwing my hook towards a nice goose that was sitting on the bank - but my conscious got the best of me. I wouldn't rule out the possibility of getting some type of bird for food soon though. I just might not make that information public for fear of riling up some animal rights groups. I am still confident that the fish will arrive soon. For now I am content with my rice and beans. Those rations will dwindle quickly if I'm not smart. On a more positive note, I have been expecting "The Headache From Hell" to be returning right about now and it has NOT! Isn't that wonderful? Why, why why? That's all I can think. Especially after reading previous years post around Day 3ish. The one thing that I did differently this year - in preparation for a head banger of momentous proportions - was to try to wear my near mouth guard device called the NTI-tss. This device is specifically designed to try to prevent migraine headaches. What do those letters stand for? Well, normally I'd say, "Ask your dentist." But since my work and my play kind of co-mingle here, it's time for a little free advice for anyone listening. NTI-tss: Nociceptive Trigeminal Inhibition - tension supression system. WOW - that's a mouthful huh? Well, actually it is not literally a mouthful. 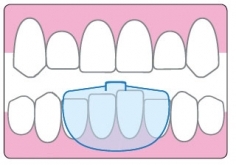 Compared to a regular full arch mouth guard (designed to prevent problems associated with clinching and grinding your teeth), the NTI is a very small, hard, acrylic mouth piece that fits over only the front four teeth (usually the lower teeth). It is quite comfortable to wear as opposed to the full arch night guard and it stays very securely in place while you sleep. The basic function is to reduce tension caused by clenching down on the back teeth. With this device in place the back teeth are unable to touch and the large masseter chewing muscles are given a break throughout the night (or day if needed). Why does this help prevent headaches? Well those big chewing muscles can work overtime and when they do, it can play havoc on your head. Keeping those muscles relaxed is very important during the long hours of sleeping and most of the people who suffer from the effects of clenching and grinding are doing it while they sleep. For me, the only thing that I did differently this year is to wear that little device so I have to believe that there is some validity to it. If you suffer from migraines, you may want to give it a try. I know that when I have a headache, I'll try just about anything to prevent it from coming back - and I have tried a lot of different things that don't work.